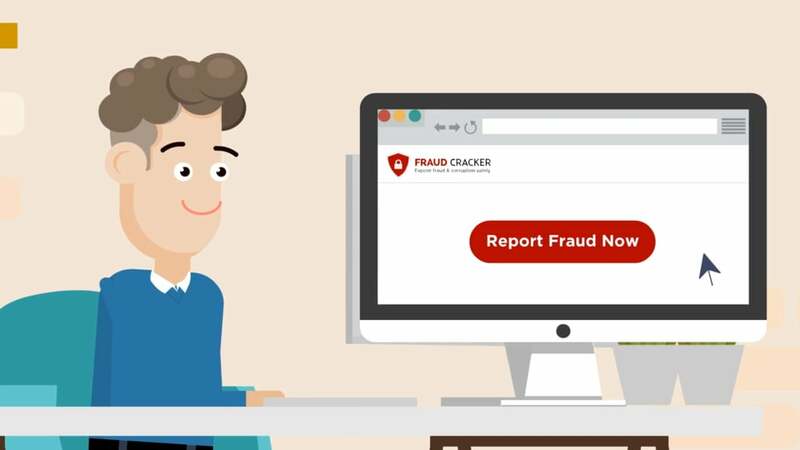 FraudCracker has developed an online solution which uses anonymous chat technology and secret employee incentives to effectively identify and prevent fraud in your business. Once you've signed up for the FraudCracker anti-fraud service, we prepare a dedicated site for your company, hosted independently on our servers, and branded with your company logo. All employees in the company are made aware of the URL or website address of your company-branded site. We provide you with some marketing material to encourage your employees to make use of the service to report fraud that they've witnessed. Suppose that an employee of your company is aware of fraudulent activity in the work-place. On your company’s anti-fraud site, the employee clicks on the “Report Fraud Now!” button, which opens up the FraudCracker feedback system in a secure browser window. The employee enters an email address (which may not be his / her work email address) so that the system can subsequently alert the employee about future responses. The employee can enter a gmail address or something similar as a further means to avoid identification. One or more nominated authority figures at the company (the ‘reportee’) receives an alert from the FraudCracker system, saying that there has been a new anti-fraud submission. This authority figure could be the CFO, Finance Director, business owner, or anyone else deemed appropriate. The reportee logs in to the system, views the employee’s submission and responds accordingly by typing a reply. This could be to obtain further information, to clarify certain issues, or simply to thank the employee for the submission. For example, the CFO might type “How long has this been going on for?” or “How much money is involved?”, etc. The employee receives an alert from the FraudCracker system, saying there has been a response to his / her submission. The employee logs in to the system, views the reportee’s response and then chooses a nickname before responding accordingly. The back-and-forth conversation continues in this manner until the submission has been dealt with as deemed appropriate. THE EMPLOYEE REMAINS COMPLETELY ANONYMOUS THROUGHOUT THE WHOLE PROCESS! To incentivise the reporting of fraud, your company can offer employees a reward for doing so. This reward could be a percentage of any monies recovered from the guilty party (subject to a maximum limit) or simply a fixed amount for any report which leads to action being taken (eg. disciplinary action against the guilty party, criminal prosecution, etc.). It is crucial that the employee being rewarded remains anonymous throughout. This can be achieved through the FraudCracker system. You simply inform us that a successful report was filed and then pay the agreed reward into a trust account. We then use this cash sum (less a small processing fee) to purchase a digital voucher for Amazon.com, the world’s largest online retailer. We deliver the voucher electronically to the employee’s email address, without needing to know his or her identity. Alternatively we can pay the employee with cash using cardless ATM withdrawals to retain anonymity of the employee.